We were looking at reasons why it is better to rent a car in last week's Finance Fridays. For this week we are turning to the finance news of the week – the annual Budget Statement. 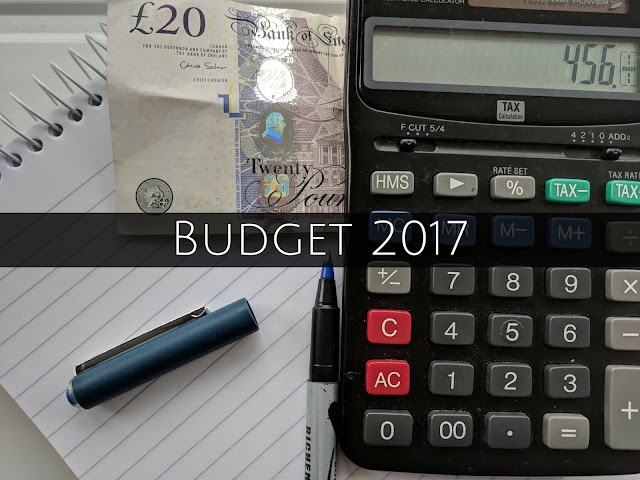 Now the main Budget has been moved to November it is now the first time we learn of decisions such as personal tax allowances for the next year. Let's have a look at some of the main talking points. For the tax year 2018/19 the annual personal allowance will increase from £11,500 to £11,850. The higher rate 40% bracket will be applicable to those earning over £46,350 – up from £45,000. From April 2018 the National Living Wage, payable to workers aged 25 and over, from rise from £7.50 per hour to £7.83 per hour. An increase of 4.4%. This was the big headline announcement of the day. For first time buyers Stamp Duty has been abolished with immediate affect on the first £300,000 on properties up to £500,000. Stamp Duty is a tax that has to be paid on completion of a house sale. The cost of it has often been seen as a barrier to some people getting on the property ladder. Previously a property costing £300,000 would have attracted a Stamp Duty charge of £5,000 but this has been cut for first time buyers. Of course this amount can now be added to the house deposit or used to help furnish the property. In order to be classified as first time buyer it means you have never owned land whether it be leasehold or freehold. The price of cigarettes is set to rise again as the tobacco tax will see an increase of inflation plus 2%. For hand rolling tobacco an additional 1% will be levied. Although Scotland recently agreed to introduce a minimum price for alcohol the duty on most alcohol will be frozen. The exception to this is the high strength 'white ciders'. The war on diesel cars continues with a one-off charge being levied on the most polluting diesel cars bought from April 2018. As cars get cleaner fewer cars will be hit by the charge. The good news for all drivers is that the fuel duty charge has been cancelled for the eighth consecutive year. The introduction of Universal Credit hasn't been smooth and more worry has been caused by news that could be a six week delay in payments for claimants when the switch over occurs. Some tenants have already been sent eviction notices if they fail to pay their rent during this initial period. The six weeks has now been reduced to five weeks which still can cause undue hardship for many claimants. From February 2018 the seven day waiting period will also be removed so claimants will be entitled to Universal Credit dating from the first day of application. What did you think of this year's Budget? Are you going to be a winner or loser financially? If you want to join in with this week's Finance Fridays then add your link to the linky below. Any post concerning financial matters is allowed. Full details here. It doesn't have to be published today as you have until 23.55 on Tuesday 28th November 2017 to join in.